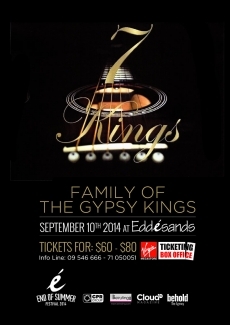 Edde Sands “Summer Festival 2014” presents the Seven Kings… The Family of the Gipsy Kings. The Seven Kings are the new generation of the original Gipsy Kings. They make you travel to the gipsy world of yesterday; they follow the path of the great line of Reyes and present their original songs with a modern twist. 60$ Regular including 1 drink.